Venetian mirror of the final 19th. > MARCOS Y ESPEJOS ANTIGUOS.>Venetian mirror of the final 19th. Venetian mirror of the final nineteenth century, exterior mirrors beveled and carved with floral motifs. 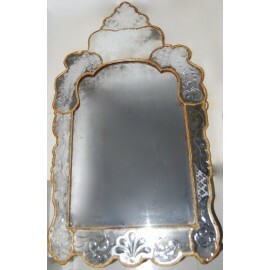 Antiques Venetian mirror of the final nineteenth century, exterior mirrors beveled and carved with floral motifs, union margins of stucco and gilt wood, good conservation. MEASUREMENTS: 103 x 58 cm.